Soak burghul in water for 15 minutes, then drain. Add olive oil and lemon before serving. In a large frypan combine pinenuts and coriander seeds over medium heat. When the mixture has started to colour, add the sesame seeds and continue to toast until golden brown. Pour mixture into a food processor, add cumin, baharat mix, chilli power and salt and blend together. Make the plain base and chill. Place the labne in a bowl and slowly whisk in the water, add the sugar then whisk until dissolved. Whisk the lemon juice into the base. Pour mixture into the ice-cream machine and churn accordingly to the manufacturer’s instructions. 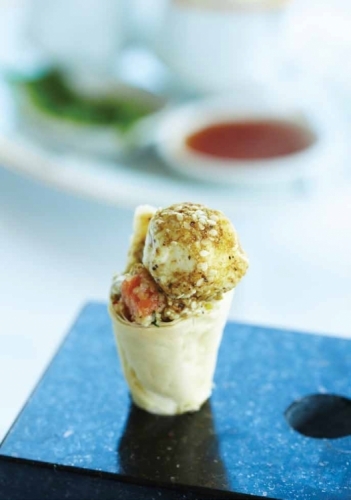 Mould gelato in Parisian scoop and coat gelato with dukkah mixture and refrigerate.